Elite guides conduct the Normandy private tour for our discerning clients and VIP clients. Customize your Normandy private tour to include your choice destinations. Tour Length: 12 hours from Paris; 8 hours from Bayeux or Caen. Departure Points: Paris or anywhere in Normandy. This upscale Normandy private tour, led by one of our exceptional Normandy tour guides, takes you to Normandy’s WWII sites. Normandy coast was setting for some of the most important events of WWII, including the largest seaborne invasion in history. Our expert guide will lead you to the various sites and will bring the events to life as you visit memorials, museums and other D-Day monuments. This particular version of a Normandy private tour begins at Pointe du Hoc, one of the Germans’ strategic fortifications along the Normandy coast, between Omaha and Utah beaches. On June 6, 1944, Colonel James Rudder and his Rangers accomplished a memorable feat of arms on the summit cliffs, pushing the Germans out. Today, Pointe du Hoc features a memorial dedicated to the heroic battle. The site remains dotted with bomb craters and German fortification remains. Your private tour in Normandy then proceeds to Omaha Beach, the site of a devastating battle where thousands of American soldiers lost their lives during D-Day. You will visit this six-mile long beach and its memorial to the fallen Americans of this ill-fated battle. Your private tour of Normandy then continues to the American Cemetery and the Visitor Center. You will have time here to pay homage to the graves of nearly 10,000 soldiers, most of whom lost their lives in the D-Day landings and ensuing operations. You will visit the Cemetery’s Memorial, the Wall of Missing and the visitor center, which will introduce you to the human stories and military maneuvers of D-Day in Normandy through photos, films, interactive displays and artifacts. Your next stop in this private Normandy tour is Arromanches (British sector), a historic site best known for its artificial “Mulberry” port, a critical success factor in the Normandy landings. You will stop at a viewpoint at the top to see the artificial port on the sea. Optional: You may decide to include a short visit to the museum (entrance fees apply) to see a 360-degree short film about the allied forces’ first hours on D-Day. Time permitting, you will also see the German Cemetery, presenting a dramatic contrast to the American cemetery. NOTE: The order in which sites are visited may vary. Inquire about customizing your Normandy private tour. 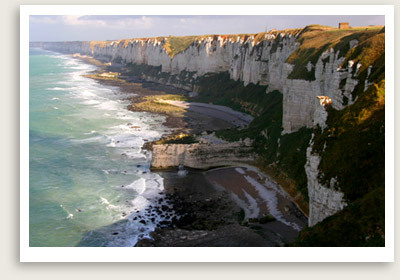 Normandy private touring using a mini-bus or coach for small groups or big groups are available. Inquire.